ClearStream is an easy to use, yet exceedingly powerful RFID and BLE compatible data collection tool that streamlines and simplifies your data collection process. ClearStream can integrate with almost any new or existing setup, including RFID, whether it be HF, UHF, or even LF to quickly gather and report your RFID tags. In addition, you can use BLE Beacons and Gateways to gather your information instead. 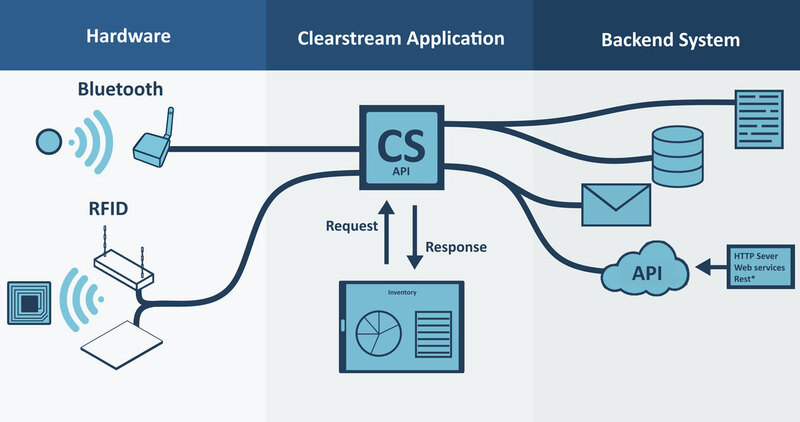 On top of functioning seamlessly with both RFID and BLE technology, ClearStream is flexible enough to integrate with any backend database or system and is easy to configure, with no programming required. Hardware: Connect your RFID Readers or BLE Gateways to a network. ClearStream Application: Configure the ClearStream Software to send data to a destination. Backend System: Stream collected data to any backend database, system, endpoint or api. ClearStream is available for Free Trial. Users with existing hardware can download ClearStream, configure it to their backend system and start streaming data. Don't have hardware yet, No problem. ClearStream's built in emulator enables users to create a mock RFID environment with Readers, Antennas and tags and stream this data to a backend system or database. Click the button below to Trial ClearStream today. ClearStream enables organizations of any size to track items and people utilizing UHF, HF and LF RFID technology. ClearStream is a powerful yet easy to use a Bluetooth (BLE) Beacon solution enabling users to keep track of items and people. Stream RFID and Bluetooth Beacon Data to backend systems and databases of your choice using ClearStream's intuitive UI.